The newest addition to our family arrived at 6:50 this morning, Sunday, July 20! 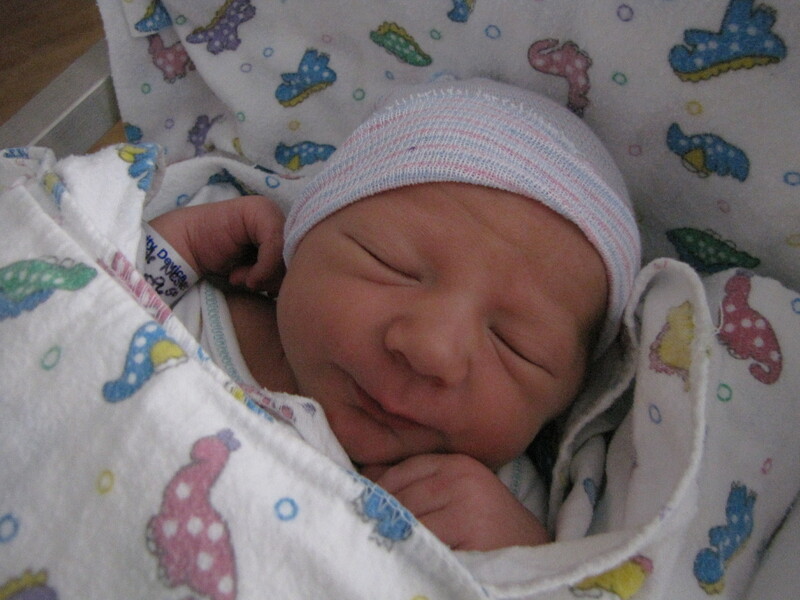 Our little Elam was 20 inches long and weighed 7 pounds, 11 ounces. Thankfully, I went into labor at home around 1:15 am and it progressed quickly. No epidural this time, either. God and my dear husband were with me all the way through. We are all doing well and I’m very thankful for that. Little E is doing well and his big brother likes him. Hopefully we get to go home tomorrow and spend some quality time as a family. Oh, and this little fella has a head full of dark hair! Ezra was blonde and hardly had any hair and is still “tow headed” to this day. More updates and pictures to come soon, I’m sure. I didn’t know what a mockingbird sounded like until a few years ago. At that point, I decided I love them. Right now, I’m very annoyed with the one outside my window at night. For the past three nights, it (he, I think) has decided to sing from about 1 until 4 am. It’s driving me batty (pun intended)! It’s cool enough right now that we’ve been sleeping with the windows open, but last night, I had to get up, close all of the windows, and turn on the air conditioning. I couldn’t take it any longer! My husband heard me up and about and asked me what I was doing. When I told him the bird was driving me nuts, he said, “It’s a sound of nature. You should be able to sleep through it.” I said “Snoring is also natural, but I can’t sleep through your snores, either!” He found that amusing. I started looking for ways to make it be quiet (besides killing it or screaming at it), and I found this interesting article dated 1987 – “Why the Mockingbird Sings”. You should check it out. Of course, I’m not going to kill this precious bird. I guess it’s just getting me ready for the newborn and the lack of sleep it will bring. Speaking of which, my due date was yesterday and still no baby. Doc says all looks well with both of us, so we’ll go back to the doc on Monday and see what goes. They said they’ll let me go up to 42 weeks before they induce me if all looks well. I really hope it doesn’t come down to that. I want this to be as natural as possible. So, say a little prayer that little baby decides to arrive this weekend or early next week! 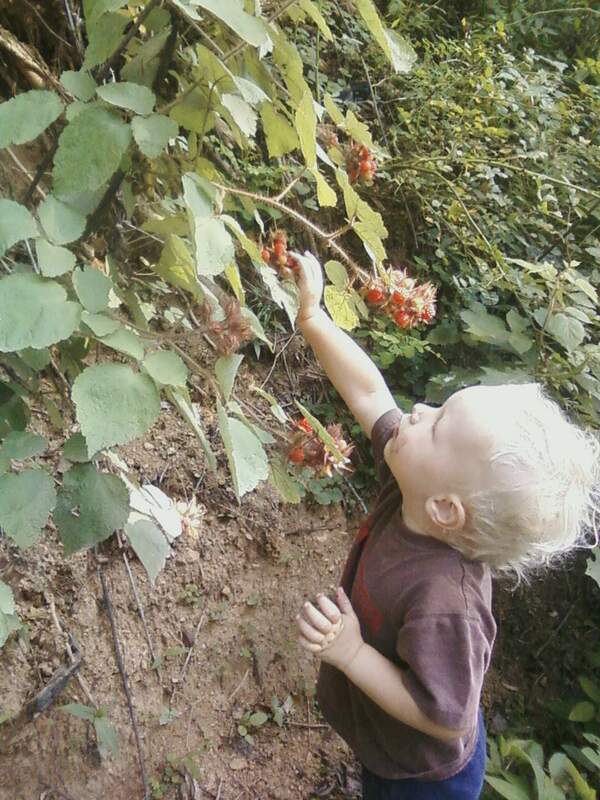 My little fella picking raspberries…he LOVES picking and eating them. As a mom, I worry about what my son eats and about his future with diabetes. Not only did I have gestational diabetes while pregnant with him (which increases his risk of getting diabetes by about 60%, I think), but his grandpa and great grandpa both suffer from diabetes. I know it’s not the end of the world to be affected by this condition, but if it can be avoided, then so be it! Set a good example by being active yourself. Please read on to learn how you can help prevent diabetes in your children or the children in your life. Not to mention how you can help prevent the disease in your own body! Type 2 diabetes once hit mainly adults. But today, children and teens weigh more and are less active. As a result, people of all ages now get type 2 diabetes. Type 1 diabetes was once called juvenile diabetes. It usually starts suddenly with weight loss, great thirst, and frequent urination. It tends to occur in thin or normal-weight people. Type 1 diabetes must be treated with insulin shots. Type 2 diabetes tends to occur in overweight people. It is also more common in people of African, Hispanic, Asian, or American-Indian ancestry. Type 2 diabetes often starts slowly. People may have vague symptoms or none at all. Some people can control their type 2 diabetes with a healthy diet and exercise. But others must take diabetes pills or insulin. Type 1 and type 2 diabetes are by far the most common forms of diabetes. But in rare cases, children get other kinds of diabetes. The risks for heart disease and diabetes increase for those who have high triglycerides, high blood glucose, low HDL cholesterol, and high blood pressure and who are overweight. Type 2 diabetes is partly genetic. Even so, it can be prevented or delayed in most cases. The key is a healthy lifestyle. Don’t buy junk food, such as soft drinks, chips, cookies, doughnuts, and candy. Have healthful foods on hand for snacks and lunch bags. More healthy choices might include nonfat milk, nuts, fresh fruit, baby carrots, cherry tomatoes, low-fat cheese, and whole-grain low-sugar breakfast cereals. Buy whole grains (such as oatmeal, barley, whole-wheat bread and pasta, and brown rice) instead of refined grains (such as white bread, white pasta, and white rice). Limit visits to fast-food restaurants or don’t go at all. Have your child eat at least five servings of fruits and vegetables each day. Serve meals at the same times each day. Serve fruit for dessert instead of cake, pie, or other foods high in fat and sugar. Instead of frying foods, cook them in low-fat ways. These include baking, broiling, roasting, grilling, steaming, and boiling. Set a good example by eating a healthful diet yourself. Limit time in front of the TV and computer to less than 2 hours a day. Assign them active chores such as raking leaves and vacuuming rugs. Have children walk or ride their bikes to school if it is close. Be active as a family. Go for walks, ride bikes, jump rope, or play basketball together. Take them for regular medical checkups. If you think a child may be too heavy, don’t put him or her on a weight-loss diet by yourself. Overweight children still need nutrients and calories to grow. Ask your doctor how to help your child lose weight. Get blood glucose levels as close to normal as you can. Get A1C levels as close to normal as you can. A1C reflects long-term blood glucose control. Prevent damage to the eyes, kidney, nerves, and heart. Being overweight makes it harder to control diabetes. For this reason, striving for a healthy weight may also be part of type 2 diabetes treatment. A child or teen who gets type 2 diabetes needs expert advice on diet and exercise. A dietitian can help both the child and the family learn to eat in a healthy way. A pediatric exercise counselor can help the child and family start an exercise program. In all cases, it’s a good idea for the whole family to change its habits. Type 2 diabetes tends to get worse over time. After a while, people with type 2 diabetes may need drugs to keep their blood glucose levels under control, even if they’ve taken good care of themselves. Drugs include insulin and many types of diabetes medicines.